The 18-hole The Tournament Course at Coyote Creek Golf Club in Morgan Hill, CA is a private golf course that opened in 1999. Designed by Jack Nicklaus, The Tournament Course at Coyote Creek Golf Club measures 7027 yards from the longest tees and has a slope rating of 144 and a 74. The 18-hole Chardonnay/Zinfandel at Poppy Ridge Golf Course in Livermore, CA is a public golf course that opened in 1996. Designed by Rees Jones and Steve Weisser, Chardonnay/Zinfandel at Poppy Ridge Golf Course measures 7048 yards from the longest tees and has a slope rating of 136 and a 74. Perched just above the northern California fog line, Diablo Grande Golf & Country Club enjoys scenic views and sunny days throughout the year. The golf course rolls through a stunning valley filled with canyons, creeks, wildlife, and vineyards. The 18-hole Zinfandel/Merlot at Poppy Ridge Golf Course in Livermore, CA is a public golf course that opened in 1996. Designed by Rees Jones and Steve Weisser, Zinfandel/Merlot at Poppy Ridge Golf Course measures 7128 yards from the longest tees and has a slope rating of 137 and a 74. Ridgemark Golf & Country Club has a peacefully secluded location, tucked away between the mountains and foothills of the Gabilan and Diablo Ranges. San Benito County has been especially hard hit by drought and so to make the best of a situation that's not ideal, the club's two former golf courses were combined into one, more challenging layout. Teal Bend Golf Club runs alongside the Sacramento River, enjoying a lush landscape covered in natural wetlands. One of the characteristics the course is known for is its stunning scenery, which works against the challenging layout by being almost too distracting. California's Central Valley stretches over 450 miles through the center of the state and parallels the Pacific Ocean. Also called the "Sacramento Valley," it encompasses such towns as Bakersfield to the south, past Sacramento and Fresno to Stockton at the northern end. Mostly flat, the region is especially rich with agriculture, thanks to fertile soil producing a wealth of gardens, farmlands and wineries. The Central Valley produces 8 percent of America's agriculture despite a land mass much smaller. Well off the beaten path compared to California's larger tourist hotspots such as Yosemite National Park or Lake Tahoe, small farmers markets, roadside produce stands and winery and cheese festivals showcase the valley's fertile landscape. While the northern part of the valley receives about 20 inches of rain each year, the southern area, the San Joaquin, is a much drier and can very get hot in the summer, while the winter months are foggy and rainy. The golf courses around the Central Valley are lesser known compared to California's other regions such as Monterey or Palm Springs, but the many cities scattered throughout offer more understated courses. This also means you'll discover some of the better bargain plays in the region, even if the headlining golf courses of California are to be found elsewhere. The 2015 U.S. Senior Open will visit Del Paso Country Club in Sacramento from June 22-28. The event -- only the second U.S. Senior Open in California history -- will allow the private club to celebrate its 100th anniversary in style a year early. Many golfers who play the Alister MacKenzie Course at the Haggin Oaks Golf Complex probably don't even know who the good doctor is. They're just looking for a round that's playable, affordable and convenient. Haggin Oaks is all that and more. The Bing Maloney Golf Complex in Sacramento -- a city-owned facility that includes a 6,569-yard course, a nine-hole, par-3 course (with two short par 4s) and large lighted range run by Morton Golf -- has been a local favorite since opening in 1952. Apple Mountain Golf Resort in Camino offers secluded and stunning mountain golf in the foothills of the Sierra Nevada Mountains a half-hour's drive east of Sacramento. Almost every shot required during the round is a test of target golf. Still, while there's no shortage of challenge here, the moments of sheer wonderment help make up for the lost strokes. Architect Perry Dye -- Pete's son -- is adept at fitting an interesting course into a tight space. In designing Bartley W. Cavanaugh Golf Course, a Sacramento muni that opened in 1995, he used mounding and landscaped trees to separate narrow fairways. Strategically placed ponds allowed him to build multiple green sites in close proximity without creating a shooting gallery. There are moments at San Juan Oaks Golf Club when golfers can't hear a thing but utter silence. No cars, no voices, no sense of civilization. Set amid hilly countryside 45 miles south of San Jose, Fred Couples routed the course through a natural setting of ponds and wetlands. It's far from the hustle and bustle of Silicon Valley. Playing the Alps hole at Stevinson Ranch is indicative of the interesting challenges at this unique golf outpost in California's lush San Joaquin Valley 90 miles east of San Jose. The drivable, 338-yard par 4 features a massive mound obscuring the view of the green and the pin. It's the perfect example of the collaboration between owner George Kelley and architect John Harbottle III. Lake Tahoe Golf Course may not have the pedigree of its neighbor Edgewood Tahoe, six miles to the north, but it shouldn't be overlooked by anyone making a trip to the South Shore of Lake Tahoe to play golf. Opened in 1962, this William Bell design is nestled in a meadow with plenty of views of the Sierra Nevada Mountains. Lone Tree Golf Course, located about an hour east of San Francisco, opened its original nine holes in 1934. The current 18-hole design has a yesteryear-type yardage at 6,427 yards from the back tees. But combine small and, at times, elevated greens with a brisk afternoon wind, and the course is plenty challenging for all players, Brandon Tucker writes. 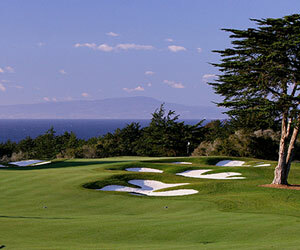 Every golfer should at some point tee it up on the Monterey Peninsula. That's where Pacific Grove Golf Links comes in: It might be the best value for oceanfront golf on mainland North America. Weekend rates for non-residents top out at $52 walking. Greens, while small, are in smooth, consistent shape, which is a testament considering the amount of rounds played here each year.